Happy Chanukah! Hope everyone is enjoying the holiday season! 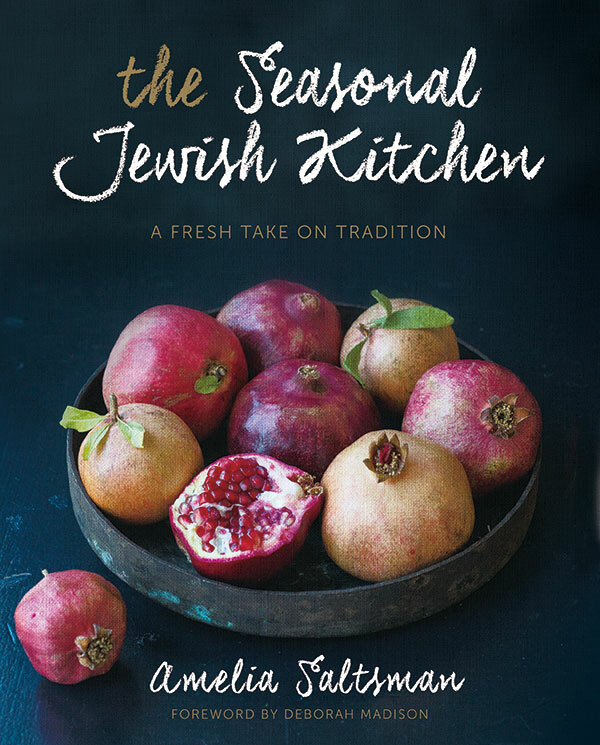 I’m taking a break from Latkefest 2015 to tell you about this fabulous new cookbook – The Seasonal Jewish Kitchen by Amelia Saltsman. I’m also hosting a giveaway for this cookbook, so don’t forget to enter. The Seasonal Jewish Kitchen by Amelia Saltsman is a fabulous cookbook that explores traditional Jewish foods while sticking to the Jewish calendar. Filled with beautiful photos and wonderful stories, this book really spoke to me. As someone who tries to cook seasonally, I felt like this cookbook was made for someone like me. I also loved that even as a Jewish cookbook, it wasn’t just about the potato kugel and the brisket. Amelia writes about the history of various foods and where they came from, while sharing about why they’re important to the Jewish calendar. I love that all of the foods in her cookbook are fresh and inspirational – using very clean ingredients. I recently made her Lamb, Butternut Squash & Quince Tagine and it was a huge hit with my family and guests. I also made her Winter Greens Saute and I know it will be a staple on our table over the next several weeks. I highly recommend this cookbook for anyone who loves exploring new flavors, while sticking to the traditional Jewish calendar. Even putting aside the Jewish calendar, this book stands out as a fabulous cookbook with fresh recipes. This Shabbat, I plan on serving Amelia’s Braised Beef with Semolina Dumplings. It’s the perfect Shabbat Chanukah meal. Because I rarely share desserts with you, I decided to share this fabulous winter cake recipe with you. 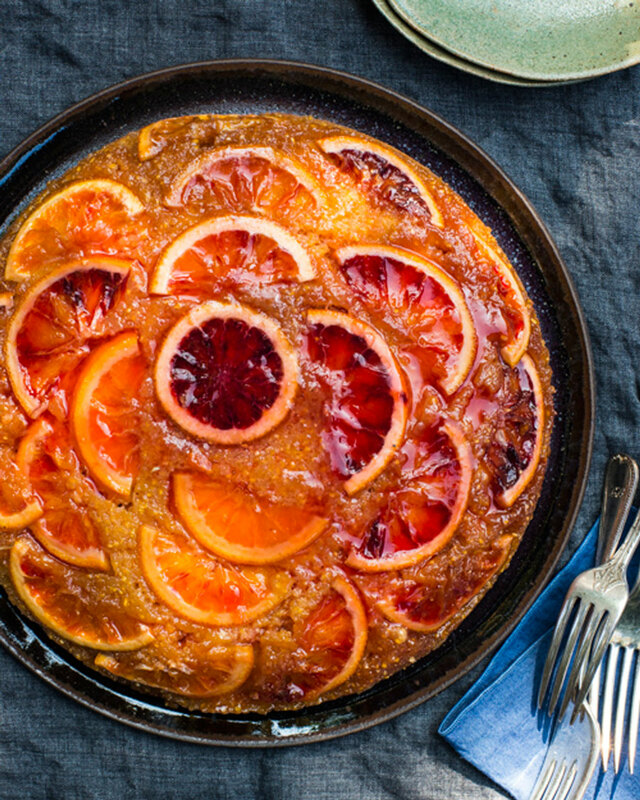 Blood Orange & Olive Oil Polenta Upside Down Cake evokes flavors of the Middle East and would be a special treat for your holiday table. Syrup-soaked cakes, usually made with semolina and called tishpishti or namoura, are popular throughout the Middle East. With its stained-glass effect from the variegated colors of blood oranges, this upside-down cake, which gets its nubbly texture from sunny cornmeal, is drenched in a sophisticated ruby-red blood-orange syrup. Use fine-grind cornmeal or polenta; stone-ground meal doesn’t get tender enough in baking. Preheat oven to 350°F (180°C). Using a Microplane grater, grate zest from 2 of the blood oranges and reserve. Juice the 2 oranges and reserve. Cut both ends off of each of the remaining 2 oranges, then cut each orange crosswise into rounds ⅛ to 1/16 inch (3 to 2 mm) thick. Cut all but one of the slices in half and discard any center pith. Sprinkle brown sugar evenly over the bottom of a flameproof and ovenproof 10-inch (25-cm) skillet (a well-seasoned cast-iron skillet is perfect) and sprinkle with 2 tablespoons of the orange juice. Heat skillet over medium-low heat until most of the sugar is bubbling. Remove from the heat. Starting at the outer edge of the pan, lay the halved orange slices in the melted sugar with the “scalloped” edge of each slice touching the edge of the pan. Fit as many orange slices as you can into the circle, pinching their corners as you set them into the hot sugar (use a knife point or tongs to adjust the fruit as needed). Some slices will have a “prettier” side; make sure those are placed face down in the sugar. Arrange the remaining halved orange slices in concentric circles toward the center, finishing with the reserved whole slice in the center. In a medium bowl, sift together the flour, cornmeal, baking powder, and salt. In an electric mixer fitted with the paddle attachment, beat together the oil and granulated sugar on medium speed until thickened and golden. Add the eggs, one at a time, beating well after each addition until mixture is thick and creamy gold, 3 to 5 minutes total. Beat in the zest and 1 tablespoon of the juice. On low speed, add the flour mixture in three batches, beating after each addition just until blended. Pour batter evenly over the orange slices and gently smooth the top. Bake the cake until golden brown, the top springs back to the touch, and a toothpick inserted into the center comes out clean, about 25 minutes. Let cool in the pan on a wire rack for 5 minutes. Run a thin-bladed knife around the inside edge of the pan to loosen the cake sides. Invert a serving plate over the cake, invert the pan and plate together, and lift off the pan. If any fruit sticks to the pan, loosen it with a spatula and place it on the cake. While the cake is hot, use a fork or bamboo skewer to make holes in it without going all the way through. While the cake is baking, make the soaking syrup. Fill a medium bowl one-third full with ice and a little water and nestle a smaller bowl, preferably metal, in the ice bath. Pour ¼ cup (60 ml) of the remaining orange juice into a small pot, sprinkle the gelatin on top, and let soften for 5 minutes. Stir granulated sugar, Cointreau, and lemon juice into the remaining orange juice, then stir the mixture into the softened gelatin. Bring to a simmer over medium heat and stir to dissolve sugar and gelatin, about 1 minute. Do not allow to boil. Pour syrup into the waiting bowl and stir from time to time until it thickens to the consistency of maple syrup, about 15 minutes. Spoon or brush some of the syrup over the cake. Allow it to soak in, then spoon or brush on more. Repeat until you have used all the syrup. Allow the cake to cool completely before slicing, then cut into wedges with a serrated offset knife to serve. The holidays are upon us. So much craziness. I’m thrilled that I get a fresh dinner on the table – let alone somehow manage to pull off a holiday meal. Each day I come home from work with a new menu idea and a new shopping list. I know I should probably just stick to just one idea, but I’m always inspired by new things I see. My menu tends to change up until the actual holiday day. As long as it’s a holiday I can cook on, I tend to play and go with whatever my mood dictates. As long as I have some fresh veggies and proteins on hand, I’m good to go. The only thing I have trouble with though is dessert. I love chocolate and cookies as much as every other person out there, but I’m not always creative about it. 90% of the time, I tend to rely on my trusty cookbooks. That’s where a book like The Holiday Baker by Paula Shoyer comes in. This cookbook is filled with fabulous treats to bake up in my kitchen. Paula Shoyer makes holiday desserts simple to create. Her recipes are easy to follow and the photos in the cookbook make me want to make and eat everything right away. She even has a fantastic section on must-have tools and tips. Was thrilled to get a copy of the cookbook this holiday season. My daughter has flagged about 10 recipes that I MUST make. Everything with chocolate was at the top of my list. 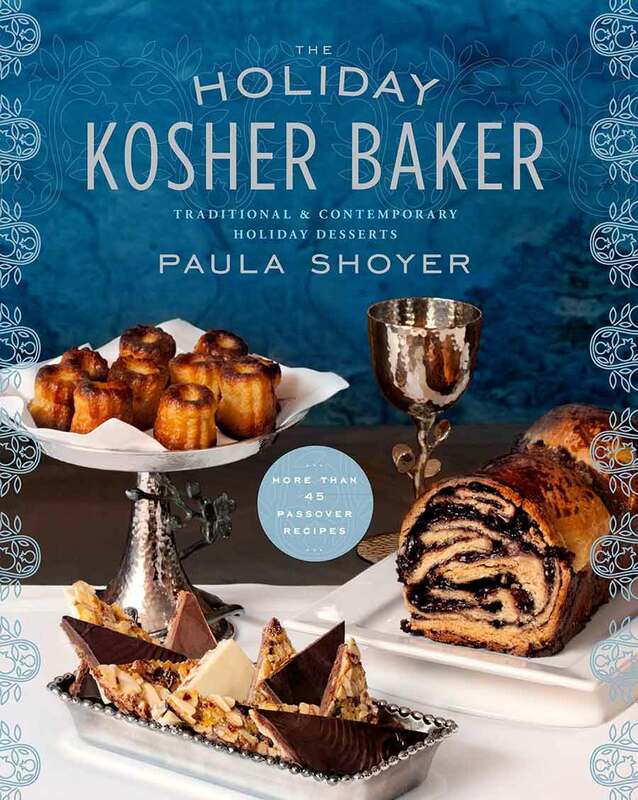 Paula Shoyer’s recipe for Babka Bites are on my must-make list. Such an amazing treat and the recipe is super easy to follow. I highly recommend you make this now. Don’t forget to enter this fabulous giveaway for this amazing cookbook! Shana Tova! Happy New Year. May you have a happy and sweet New Year! PLACE WARM WATER, yeast, and 1 teaspoon sugar into a large mixing bowl or the bowl of a stand mixer and let it sit for 10 minutes, until the mixture bubbles and thickens. Add the ¼ cup (50g) sugar, flour, salt, margarine, oil, egg, and egg white. Combine with a wooden spoon or a dough hook in a stand mixer until all the ingredients are mixed in. Cover bowl with plastic wrap and let rise 1 ½ hours. PLACE THE MARGARINE into a medium or large bowl and beat until creamy. Add the cocoa and sugar and beat until combined. Cover with plastic and let sit at room temperature while the dough is rising. PREHEAT OVEN to 325°F (160°C). 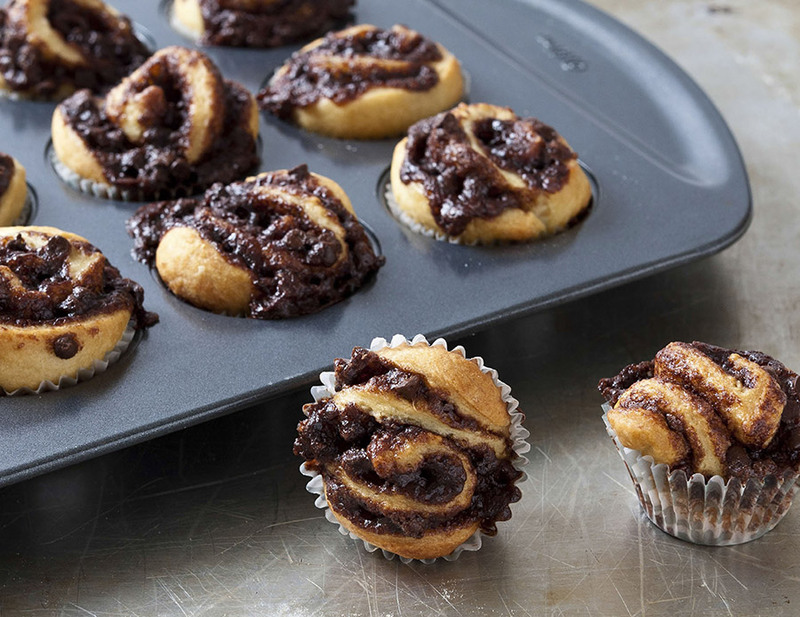 Place mini muffin papers into a 12-cup mini muffin pan. You will need to bake Babka Bites in batches. slices and place one into each of the muffin cups, cut side up. You will have about 24 slices. Repeat with the rest of the dough. Today’s recipe is part of the Kosher Connection link-up. The Kosher Connection is a group of food bloggers who happen to be kosher and are working hard to bring amazing flavors to the kosher community. This month’s link-up theme is croutons. When I first saw the email, I have to admit, I was a bit skeptical. What can I do with croutons that I haven’t done before? I’ve made soup croutons before, and those were pretty awesome. I like croutons in my salad as well. Those have been done before, and I wanted to do something different. My daughter suggested cotton candy croutons. Not sure that’s workable. It did lead me on a quest for sweet croutons. I knew my croutons had to include chocolate. I came up with a mocha pound cake recipe that is perfectly suited for croutons. You can use your own favorite chocolate pound cake recipe or even a store-bought chocolate pound cake. My original intention was to pair the croutons with a warm pudding dish. As I was discussing this dish with my family this morning, a warm compote was recommended. I’ve never made compote before, but I warmed up to the idea. I quickly ran over to my fruit & vegetable market and picked up some berries. While this recipe has a few steps involved, it is totally worth it. This dessert was amazing. Will definitely make this again. Place all of the ingredients, except for the corn starch slurry, in a sauce pan on the stove on medium-high. Stir everything together until the mixture begins to boil. Once the mixture is boiling, add in the corn starch mixture. Cut up the pound cake in to 1-2 inch squares. Lay the pound cake pieces on a sprayed baking sheet in a single layer. Bake in the oven for 5-7 minutes. Flip cake squares over and bake another 4-5 minutes. Remove from oven and cool slightly. You may notice that the cake croutons seem a bit soft when you pull them out of the oven. They will crisp up as they cool. Serve the berry compote warm with some vanilla ice cream and the yummy chocolate croutons. Enjoy! Turn down the heat and keep cooking and stirring. The berries will begin to disintegrate and the mixture will thicken a bit. Cook the compote on medium low for about 10-15 minutes, stirring every so often. Keep the compote on low until you are ready to serve. Serve the berry compote warm with some vanilla ice cream and the yummy chocolate croutons. In my constant need to use things up, I came across a lovely bottle of raspberry jam in the fridge. It sat open and largely unused. I remember purchasing it with good intentions. Probably at someone’s request. When I asked why it wasn’t used, I was informed that strawberry was the preferred jam flavor. Ah well, I tried. I like raspberries. Why not bake with it. I decided to test out a gluten free raspberry bar recipe that I had been playing with. I sprinkled on some chocolate chips, since dark chocolate and raspberry always go well together. In a food processor, pulse the almond meal, flour, sugar, vanilla, salt, baking soda and butter. Pulse a few times. Add in the oats and lemon zest and pulse some more. Mixture should be crumbly but stick together a bit. Butter a 9×13 baking pan. Press 3/4 of the mixture in to the baking pan to form a crust. Spread a light layer of the jam over the crust. Sprinkle some chocolate chips on top. Not too many. Sprinkle the rest of the dough mixture on top of that. Bake for around 25-30 minutes or until the top has browned a bit. Let cool for an hour before cutting.